We're guided by Axios Future Editor Steve LeVine; Managing Editor Alison Snyder; reporter Stef Kight, who follows immigration and demographics; and Harry Stevens and the Axios Visuals team. Whichever the case, almost no one seems prepared. People are going to have to work longer, experts say. And the U.S. requires "major reforms" in its programs for the elderly, says Richard Cincotta, director of the Global Political Demography Program at the Stimson Center, and fofrmerly a lead demographer for the U.S. intelligence community. But the government "seems to be nowhere near making the social security reforms that are needed." Largely because of Africa, the global population is forecast to continue rising through the century, past 11 billion. But according to the United Nations, there is a 23% chance the world population will stabilize or fall by then in a phenomenon that some demographers call "peak human." By 2100, the population of the world's poorest countries will more than triple, from 954 million in 2015 to 3.2 billion. This means "a rising fiscal burden and slower economic growth than if the population was not aging," says Richard Jackson of the Global Aging Institute. Changing economic incentives, social expectations for women, and religious landscapes have upended the age structure of populations around the world — and we're only seeing the beginning. 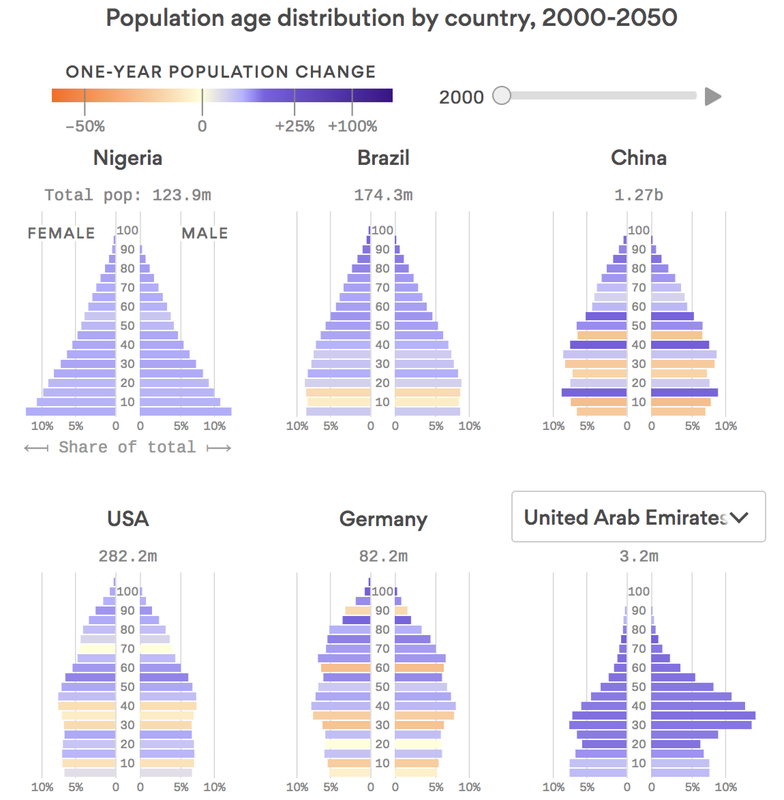 Axios' Stef Kight reports: The developed world is having fewer babies, which means fewer working-age people to support the bulge of retiring baby boomers. Meanwhile the population of Africa is surging. In developing countries, women's education and opportunities outside of raising a family lag behind the richer world, resulting in more women bearing children than their developed-world counterparts. The 10 fastest shrinking countries on Earth are in Eastern Europe, according to the United Nations. Japan, perhaps the country with the most often-analyzed demographic challenges, is only 11th, per Axios' Dave Lawler. Go deeper: Read the rest of Dave's piece. Japan: Immigrants make up only 1.95% of the population, with fertility rates declining and immigration highly unpopular. Its foreign-born population has grown by 40% just since 2013, according to the Migration Policy Institute. But that's still far from the 10% share of the population needed to halt shrinkage. Germany has a lower fertility rate than the U.S. or U.K. The country has seen a surge of Syrian immigrants, but anti-migrant politics have followed, threatening Chancellor Angela Merkel's hold on power. The U.S. and U.K. are "lagging behind in robotics because they are not aging as rapidly," economists Daron Acemoglu and Pascual Restrepo write in a recent National Bureau of Economic Research working paper. If fertility rates could be reduced, it could help boost Africa's economy, with fewer children to care for and more workers to contribute. Such a "demographic dividend" helped fuel the economic expansion of the East Asian "Tigers" between 1965 and 1990. More pessimistically, Japan's own National Institute of Population and Social Security Research projects a population under 50 million by 2100. Whichever is correct, Japan is one of the planet's cases of extreme demographic change, shrinking and growing old at a greater pace than anyone. "Compared with other developed nations, Japanese people on average eat fewer calories per day, and in a healthier pattern," Naomi Moriyama, author of Secrets of the World's Healthiest Children, told the "Today" show. Key quote: "There’s a potential for some significant positive offset through higher elderly workforce participation," Richard Jackson, president of the Global Aging Institute, told Axios. "It’s also possible — but not certain — that health spans will continue to rise along with life spans, and that may take some pressure off." Steve reports: Greater longevity is part of a debate over Earth's future population in which a small, contrarian group of researchers *is* contesting the consensus forecast of more than 11 billion humans by the end of the century. That is 2.3 billion fewer than the consensus U.N.-produced forecast. And if it's right, the primary economic narrative becomes less one of resource management, and instead population shrinkage. "We can be richer without having to produce more," Jesus Crespo Cuaresma, of the Vienna University of Economics and Business, tells Axios. "You can get people out of poverty without harming the environment." Thanks for reading. Sign up for here for Steve's newsletter, and more.